How to use Hotmail or Outlook.com with the application on PC? It demands POP3 and SMTP, what should I do? 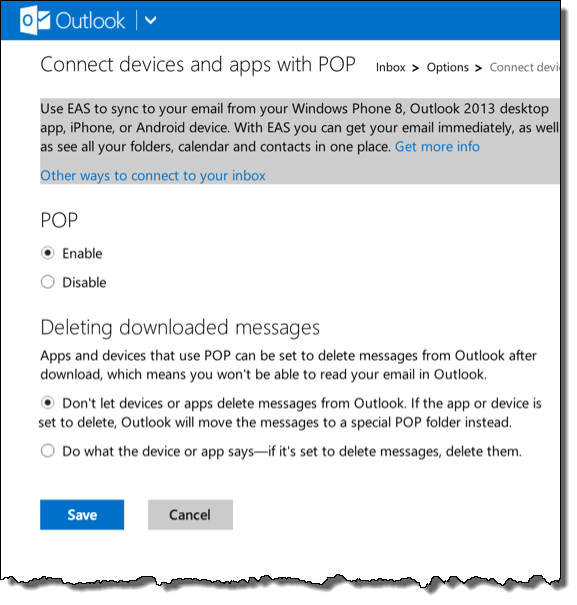 Microsoft has enabled POP3, IMAP and SMTP access to Outlook.com as well as Hotmail accounts. The instructions below will help you how to set them up. The development of devices running email program which has been installing POP3, SMTP, moreover, IMAP is becoming a standard requirement for various email services. Microsoft did not provide the ability to connect with an email program desktop, but they added it to Hotmail a few years ago. Although the Hotmail has been switched to Outlook.com, the functionality is retained. Email programs desktops and various mobile phones will ask for this information in different ways and different places. When you log in with the information above, the email program can also inquire about the protocol that uses to communicate with the server of the service provider. Configured as described above, you will be able to send email from your email program to your desktop computer through Outlook.com. In POP, select ‘Enable’, and then click’ Save’. Note that you also have the option to delete messages on the server or not. "Leave messages on server": which most of the desktop has. "Do not let devices or apps delete messages ..."
If you choose this option, you still can read the messages through the interface of Outlook.com web until you delete them there. IMAP is probably the most convenient way to access email on computers and devices and keep them in sync with each other. The downside is that a more-or-less continuous internet connection is typically required for the best experience.